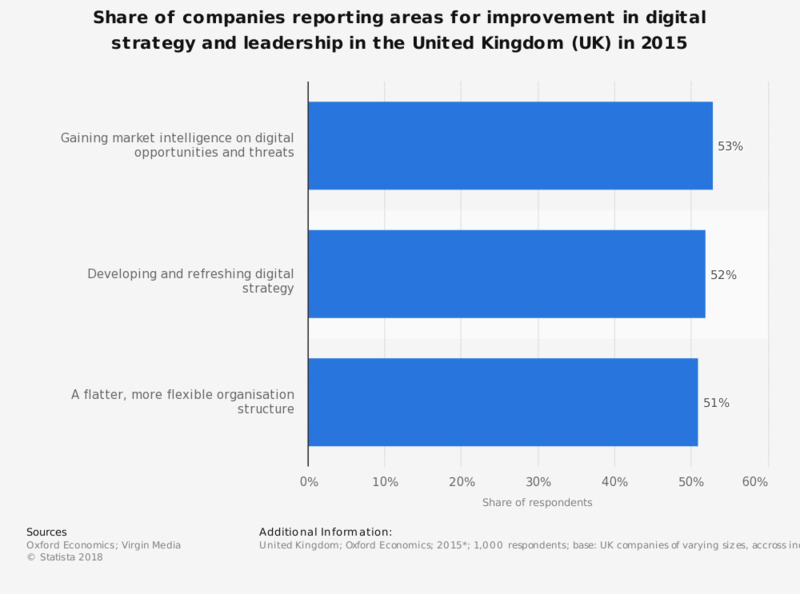 This survey illustrates the share of companies that report certain areas of improvement needed in digital capabilities in the digital strategy and leadership sector in the United Kingdom (UK) in 2015. A total of 53 percent of companies in this sector reported the area of improvement needed in their company was gaining market intelligence on digital opportunities and threats. What level of priority does your leadership team give to the following six digital capabilities in the next three years? What level of priority does your leadership team give to digital capabilities in the technology infrastructure sector? What level of priority does your leadership team give to digital capabilities in the digital information sector? What level of priority does your leadership team give to digital capabilities in the digital customer engagement sector? In which region of the UK are your headquarters located?